Northside Gynaecology is looking for dynamic gynaecologists dedicated to women’s health. No private practice experience necessary. We’ll teach you! Northside Gynaecology is an all-female team of gynaecologists and support staff dedicated to compassionately meeting the unique and changing gynaecological needs of women and helping them improve their quality of life. Established in 2011 by director Dr Archna Saraswat, the practice now boasts a dynamic team who thrive on the latest medical innovations and practice management systems and processes. This makes Northside Gynaecology a progressive practice on Brisbane’s northside that is a pleasure to be a part of. Operating from three northside locations – Kedron, North Lakes and Caboolture – the rooms at Kedron are stylish, custom-designed with an elegant décor. With a welcoming reception and spacious private bathroom facilities, each consulting room is fully equipped with state of the art medical equipment and reusable medical devices. Each doctor enjoys full practice management and administrative support in a paperless office for all patient care needs including scheduling, billing, dictation services and hospital bookings. Known for providing general gynaecology as well as specialist solutions for patients from 12 to 95 years, the practice boasts a strong referral base of local GPs and other specialists. We also run a successful online marketing and advertising program of AdWords, newsletters, content blogs and Facebook advertising and content. We organise an annual GP conference every year presenting on the latest gynaecological topics which is attended by more than 70 GPs – driving referrals and building the Northside Gynaecology brand. Always placing the patients’ needs first – from their first contact with reception to their completion of treatment, Northside Gynaecology is based on the motto “what’s new and how can we do things better”. The practice has a sharing, inclusive and caring culture that thrives on keeping up with the latest in medical, medico-legal, IT and practice management systems. 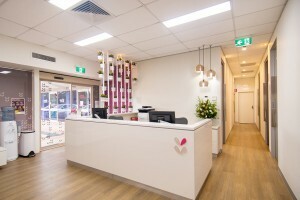 Northside Gynaecology was the first practice in Brisbane to use the innovative MonaLisa Touch™ vaginal laser treatment for vaginal discomfort, and one of the first Brisbane practices on the northside to use single cut laparoscopy technique. The practice strongly supports ongoing professional development and innovation, with doctors and practice management staff regularly attending national and international conferences. Northside Gynaecology is owned and operated by gynaecologist Dr Archna Saraswat. Moving to Australia in 2004 as an international medical graduate, Archna obtained her MD in gynaecology at Maulana Azad Medical College, one of India’s top medical schools. She obtained her Australian Fellowship (FRANZCOG) in 2008 after training at the Royal Women’s Hospital, Melbourne, the Royal Brisbane and Women’s Hospital and Mater Mothers’ Hospital, Brisbane. She was a staff specialist at the Caboolture Hospital before commencing private practice in 2011. Archna drives the warm and dynamic culture at Northside Gynaecology, always seeking to find what’s new and how to improve the way the practice operates. Archna has built a team of gynaecologists and support staff, many of whom have been working with Northside Gynaecology since opening. Practice manager Kristy Howell joined Northside Gynaecology in 2013 and brought with her a wealth of knowledge in medical practice systems, procedures and processes. Kristy works with the new gynaecologists to set up their practice – from obtaining a location specific provider number, hospital accreditation and theatre lists, to marketing you to referring practitioners. Northside Gynaecology offers gynaecologists all the benefits of your own practice without the associated ongoing administrative burden and pressure of establishing it from scratch. Whether you want to work part-time to fit around your family or other life-balance needs, or whether you want to build a full-time practice and become a partner in the business, Northside Gynaecology provides the flexibility to suit your needs. We offer gynaecologists an attractive and simple remuneration arrangement where you are charged a percentage of your consulting fees for administrative services. There is no minimum month service fee like some other practices. Patients pay us and we pay you fortnightly, so there’s no need to have a complicated accounting system. we’d love to talk to you. We can either meet you at our rooms and show you around, or chat at a location convenient to you. Please contact Practice Manager Kristy Howell at kristyh@northsidegynaecology.com.au.